The Kyle Combination (sometimes referred to as Kyle Union) was formed in around 1852 and comprised the 13 parishes of Auchinleck, Ayr, Coylton, New Cumnock, Old Cumnock, Dalmellington, Dalrymple, Mauchline, Muirkirk, Newton-upon-Ayr, Ochiltree, St Quivox and Sorn. Dalrymple, Newton-upon-Ayr, and St Quivox later withdrew from the Combination. The total population of the member parishes in 1881 was 63,588. The Kyle Combination poorhouse was erected in 1857-60 on Holmston Road in Ayr, with first Governor and Matron being appointed in April 1860. 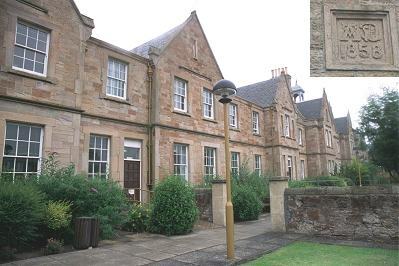 The buildings were designed by William Lambie Moffat of Edinburgh and originally provided accommodation for 150 inmates. A lodge stood at the entrance at the south of the site. Kyle entrance from the south, 2001. The main building had the H-shaped layout typical of many Scottish poorhouses. The block at the front was a corridor plan building with a central portion which would have contained the original Master's quarters, committee rooms and clerk's office. The two wings of the front block contained male and female accommodation, probably with the aged at the front side and able-bodied or "dissolute" inmates at the rear. Children's quarters were usually placed at the far end of each wing. Kyle main building from the south-east, 2001. The poorhouse dining-hall and chapel were located in the central block at the rear. 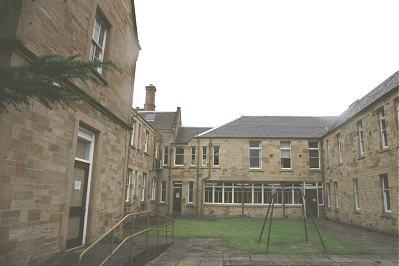 Kyle rear of main building from the west, 2001. In 1903, the General Superintendent of Poorhouses expressed concern about overcrowding at Kyle, particularly in the sick wards. A nurse at Kyle had to attend to 37 patients suffering from serious acute diseases such as pneumonia, pleurisy, phthisis and cancer, together with chronic cases of paralysis and senile decay, the latter often being "wet cases". National standards at the time proposed a maximum of 20 patients per nurse. Some wards provided as little as 438 cubic feet of space per patient, whereas national standards demanded a minimum of 800 cubic feet. In 1906, a renovation and extension programme was carried out at the poorhouse. A large block at the rear of the poorhouse may date from around this period. Kyle from the north, 2001. A Governor's house was also later added on Holmston Road at the south-west corner of the site. After 1930, the poorhouse became known as the Kyle Home Poor Law Institution. The former poorhouse buildings are now used as offices by South Ayrshire Council. In addition to its membership of the Combination, the parish of Ochiltree — according to the 1881 census — had its own poorhouse located at 5 Mill Street in Ochiltree village. Similarly, Auchinleck had a poor house or parish lodging house on Main Street. Ayrshire Archives, Watson Peat Building, SAC Auchincruive, Ayr KA6 5HW. Holdings include: Minutes (1860-1910); Stock records of clothing, issues of cigarettes and tobacco, firewood sales, etc.(1904-1977). General register of inmates (1883-1904); Indexes (1861-1977); Registers of admissions and discharges (1894-1954); Register of deaths (1860-1927); Visitors' report book (1896-1954); Sick ward register of admissions and discharges (1909-1942); Maps and plans (1904-73); Offence and punishment book (1860-1947). Thanks to Ayrshire archives for background information.